The paintbrush cares nothing of this, however, as it dips and dabs and dots at a different sort of crown. The sort a wooden baby Jesus would wear in a conservative religious household in which such regal statuettes are common. 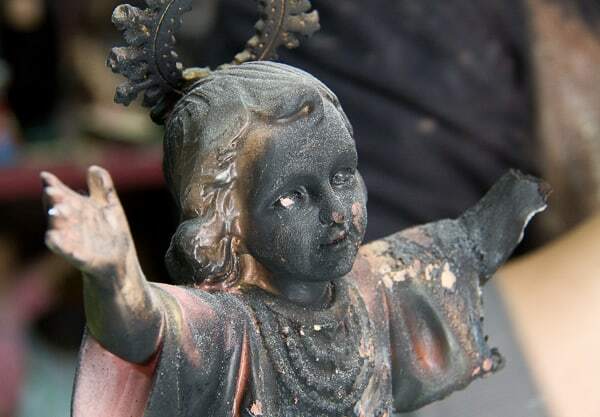 So common are the Jesus figurines – or family mascots – that baby Jesus spotting becomes a pastime as the pigeons flutter across the cobbles and the devout carry them to and from church. 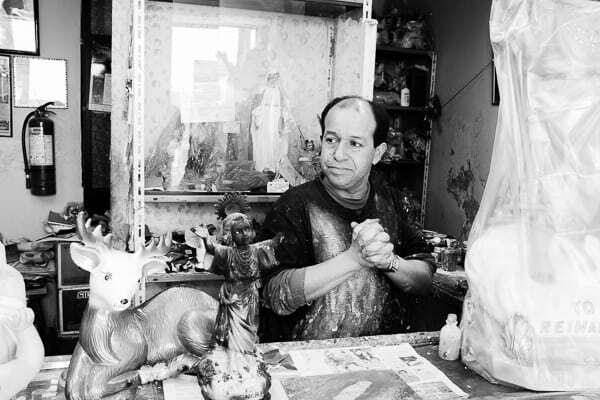 In the shops that cling into the alcoves of the Old Town, amid the Mickey Mouse piñatas and the medicinal local herbs, baby Jesus outfits stand for sale, with tassels in silk and gold. The custom, I’m told, is to dress your baby Jesus to match household breadwinner. Thus, there are policeman baby Jesus outfits and stethoscopes for doctor baby Jesuses, various firefighter hats and business suits and yet others that I suspect in another time and another age would lead to charge of blasphemy. But, however attired, these babies are cherished. 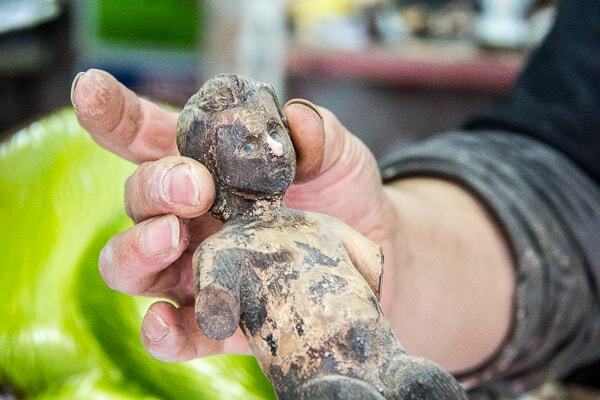 They grow to become family heirlooms – and when they burn or break there’s one man to the rescue. 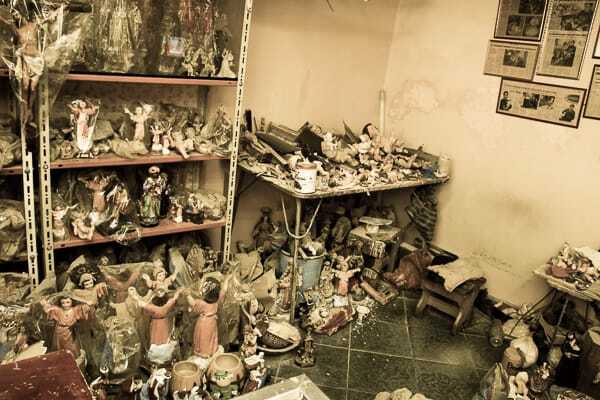 Inside the Restauraciones Carrión, the shelves look like a bric-a-brac sale in the aftermath of a bison stampede. 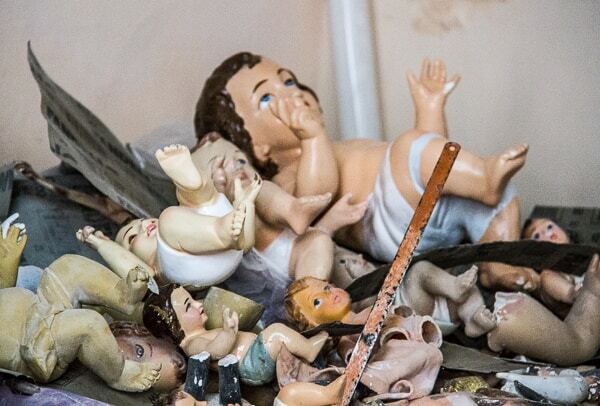 Virgin heads, cherub wings, and lots of baby Jesuses lie one atop the other in a scene of crazy carnage while one or two in particular sit on the counter top ready for repair. The paintbrush moves slowly across one. It pauses while the artist shows me other figures – Jesus with moving eyes, a decapitated Virgin Mary and a burned beyond recognition baby Jesus requiring the soot be scraped from upon him. 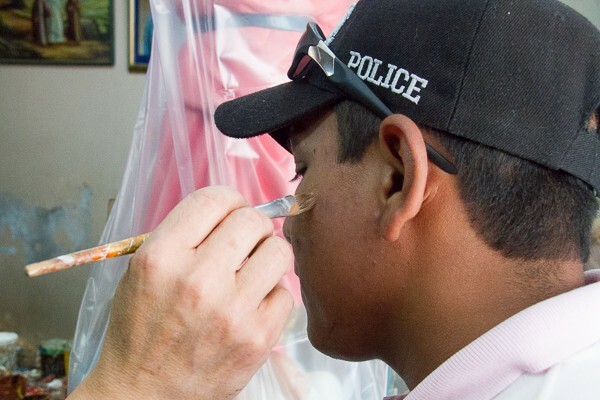 Señor Carrión mixes oil and pigment and moves from chubby figurines to the scars on the face of the man in front of him. Such camouflage lasts for three or more days, he tells me, and as many men as women attend to receive his services when special occasions hove into view. “My passion is art,” he tells me, gesturing to a collection of non-religious artefacts behind him, the handiwork in which he is most proud. At the end of up, however, the same imagery returned: more remnants of the burned age of the Spaniards, renovated, repackaged and now called Quito’s own. 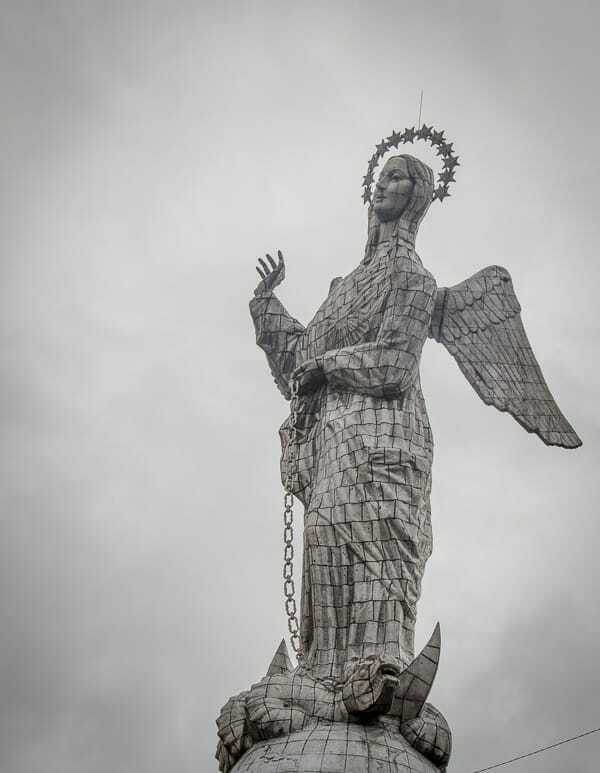 Through 7000 pieces of aluminium, Quito adds a further 45 metres to its skyline through the winged figure of the Madonna on the volcanic El Panecillo. Stars dance around her crown, a chained dragon cowers by her feet and the swirling clouds of Ecuador shift and mask the house-layered hillsides of Quito, the highest capital in the world. Well, officially the highest capital in the world. I found this fascinating cultural practice through a small tour (for two of us) called Live Quito Like A Local organised by Ecuador Specialists Metropolitan Touring. Disclosure – we paid a reduced price to travel to Ecuador from Cardiff with KLM, Metropolitan Touring and Bird PR. However, as ever, as always, I remain free to write whatever I like here on the lab. Otherwise there’s just no point. Have you heard of this practice before? What do you think? Wow, that is really cool. I had no idea those were there, and I was in Quito less than six months ago. You really captured a unique and hidden element of the city. Thanks for sharing about it! You’re very welcome! I’d have missed them, too, if someone hadn’t pointed them out to me. And then…I started seeing them everywhere! We’re heading to Quito next week – I’ll be sure to keep a look-out for an abundance of Jesus figurines dressed like the Village People! I am fascinated by the way you weave the local culture with testimonies of the day to day activities of a select unique people. Your beautiful photos also truly enhance the reading and learning experience. More amazing travels to you, Abi. Have you been to the Philippines yet? If not, do include our humble ‘pearl of the pacific’ islands in your future itinerary. 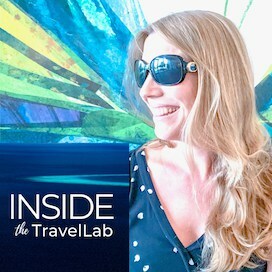 What’s so special about Quito in Ecuador?